The still unexplained and unresolved halt in screening for the phase 3 trial of DCVax-L in newly diagnosed glioblastoma multiforme has been a nightmare for the Company and its investors. It seems that almost everything has ground to a halt in the last six months as Northwest awaits guidance from the FDA on the future course of the trial. The issue has been a halt in screening patients for enrollment; patients already enrolled continued on treatment in accordance with the trial protocol. During this period there has been an absence of any meaningful information and the Company has been forced to raise capital on three separate occasions with the last two raises on very poor terms. This company-specific imbroglio has arisen at the same time that biotechnology stocks have gone through a major market correction in which small emerging companies have been particularly hurt. All of this was coupled with aggressive shorting from hedge funds. Since a press release on August 21, 2015 addressing the screening halt, the stock has plunged from $6.96 to $1.50. I have had numerous requests to comment on what I believe to be the reason for and consequences of the halt in screening. In a report on September 8, 2015 , I went through possible explanations for the halt, but none of them were convincing to me. There seems to be something really unexplained and unusual going on- some profound, missing part(s) of the puzzle. Also confounding is the time needed to resolve the issue. Back in September when I wrote the report, I expected a resolution in October and here we are in March. I am frustrated that I can’t come up with an actionable hypothesis and recommended course of action other than to just wait and see what happens. In my best effort to help investors think through this issue and its effect on Northwest Biotherapeutics, I decided to put together all of my thoughts on key issues relating to DCVax-L starting at the very beginning as to why I chose to invest in the Company because of its prospects. As a results, this is a pretty large report ranging over a number of topics and it would be difficult to sit down and read in its entirety. There are seven section sections (as listed below) and some are the size of one of my normal reports. I realize that some of my readers have neither the time nor the inclination to go through the entire report. Hence, the paragraphs that immediately follow gives a brief bottom line conclusion on each of the seven sections of this report. If you want more of my in-depth thinking you can proceed to the respective sections later in the report. The Biological Rationale for Dendritic Cell Cancer Vaccines is Compelling: I see immuno-oncology as being the future of cancer treatment. Within this broad cancer drug discovery platform, we have seen the development of monoclonal antibodies and checkpoint modulators produce significant medical breakthroughs and huge commercial successes. Investors see engineered T-cells (CAR-T) as having the same type of potential, but they have not yet embraced dendritic cell technology. I see dendritic cell technology as having comparable medical and commercial potential and in this area, Northwest Biotherapeutics is clearly a leader. Clinical Data for DCVax-L Is Encouraging So Far: The phase 1/2 data for DCVax-L showed a very strong signal of activity in newly diagnosed glioblastoma. Likewise, data from the informational arm of the phase 3 trial showed very encouraging results in recurrent glioblastoma. Both of these were open label trials and are too small to qualify as registration trials. There is the meaningful risk that signals from these small trials may not be replicated in larger trials like the current phase 3 trial. However, they provide a strong reason to believe that DCVax-L may be effective in some patients with glioblastoma. Some Points to Consider about the Phase 3 Trial: The phase 3 trial of DCVax-L in newly diagnosed glioblastoma planned to enroll 348 patients. The Company said at the time of the screening halt, meaningfully more than 300 patients have been enrolled in the trial; I take this to be around 320 or so. While screening was halted, treatment of already enrolled patients continues. The primary endpoint of the trial is an improvement of 4.0 months for median progression free survival (PFS) in the DCVax-L arm plus standard of care (SOC) arm as compared to standard of care alone. In the phase 1/2 trial, PFS for DCVax-L plus SOC was a highly impressive 26.4 months. There are large data bases from other trials that show that expected median progression free survival with SOC is consistently between 6.2 and 8.1 months. If historical results for SOC bear out, DCVax-L would achieve statistical significance if its PFS was 12 months or so. If DCVax-L were to perform as it did in the phase 1/2 trial the improvement in median progression free survival would be 18.3 to 20.2 months. Implications of the Hold on Screening: Let me start out by saying that I can’t come to a solid conclusion on why screening in the phase 3 trial was halted, when or if it might end and of course, what the next steps might be. In this section, I go over the possible scenarios, but none of them satisfactorily explain to me what is going on. There is an important piece(s) of this puzzle that is missing. It may be something highly unusual which I have not encountered before. That said, I think that the most likely outcome will be that the FDA recommends that screening be restarted and the trial completed. The next most likely possibility is that the FDA lets the trial continue with the current number of patients and analyze the data when the number of progression free events needed to stop the trial is reached. I see little chance that the trial will be halted for efficacy or that treatment of existing patients is halted, but I can’t totally dismiss either possibility. Comparison to CAR-T Cells: The two emerging biotechnology companies that are viewed as leaders in CAR-T research are Juno and Kite which have market capitalization of $3.7 billion and $2.1 billion respectively. I have already said that I believe that dendritic cell therapy technology has comparable promise as CAR-T. Also, a comparison of data that has been generated to date leads me to believe that Northwest’s data is of the same quality and promise as that of Juno and Kite. However, there is a total disconnect in the market as Northwest is valued at a $182 million market capitalization. Tracing the Historical Development of Cancer Treatment: This section provides background on how cancer treatment has evolved over the past 75 years with a focus on the rapidly increasing role of immune-oncology. Some believe that immune-oncology may ultimately replace chemotherapy. Clinical Data for DCVax-L: This is a detailed analysis of the data from the phase 1/2 trial of DCVax-L and also from the information arm of the phase 3 trial. It also touches on Provenge, a dendritic cell cancer vaccine that was approved by the FDA and the enrolling phase 3 trial of ImmunoCellular’s ICT-107 in glioblastoma. The efficacy demonstrated by these two dendritic cancer cell vaccines provides further validation of the technology base of DCVax-L.
Investors cannot really chart a course of action on the stock until there is information on the next step in the phase 3 trial of DCVax-L. I think that the most probable course of action is that the FDA will conclude that the trial should complete enrollment. This would be viewed as a positive and could also trigger a number of significant news events which I am about to discuss. I think that Northwest was very close to staring a phase 2 trial with DCVax-L in combination with a checkpoint modulator, either Bristol-Myers Squibb’s Opdivo or Merck’s Keytruda in relapsed glioblastoma. This was put on hold at the time of the screening halt and restarting the trial hinges on the course forward with DCVax-L in its phase 3 trial. If this trial focused on recurrent glioblastoma, positive results could be the basis for filing for approval. In March of 2014, Northwest announced that the Paul Ehrlich Institute (the German equivalent of the FDA) had selected DCVax-L for its hospital exemption program. The aim of this program is to make promising drugs used in life threatening diseases available before the registration quality trials are completed and formal approval is granted. This would allow DCVax-L to be reimbursed like an approved drug. We have had no meaningful update on this from management since the initial announcement. I think that plodding through the reimbursement process has been much harder that Northwest had anticipated. I also think that the halt in screening issue may have had an effect and there is the potential for meaningful news flow from this issue if the halt is resolved favorably. We have also been awaiting announcement of the start of phase 2 trials of DCVax Direct in several types of inoperable solid tumors. I expected that these trials would have started by now. The delay relative to my thinking could have been due to more detailed trial planning than I expected or the distressed financial situation caused by the screening halt could have caused a delay. These trials are comparable in design to those which led to approval for Opdivo and Keytruda and perhaps encouraging results could result in approval of DCVax Direct; they will focus on late stage cancers in which patients have exhausted treatment options. Beginning these trials is not tied to the screening issue in the phase 3 DCVax-L trial; the key issue is money. Also, DCVax-L and DCVax Direct are very different products in which success or failure for one does not necessarily point to a similar outcome in the other. Short sellers have used one their customary stock manipulation tactics to drive down the stock of Northwest Biotherapeutics by alleging that there were inappropriate dealings between Northwest and its contract manufacturer Cognate. Linda Powers is CEO of Northwest and her venture capital funds control Cognate. The short sellers are alleging that there was self-dealing that somehow enriched Ms. Powers and Cognate at the expense of Northwest shareholders. Class action law firms that act in unison with short sellers then filed lawsuits against Northwest citing information from reports written by hedge funds or their surrogates. This six month delay has left Northwest in a weak financial position. The Company ended 2015 with $22 million of cash and it then raised about $9 million in an offering in February 2016. The proforma cash position at year end 2015 including offering was about $31 million. In order to make an estimate on how long this cash will last we need to make an estimate of cash burn for 1Q, 2016 and subsequent quarters in 2016. For reference, the average cash burn for each quarter of 2015 was $20 million, but shares and stock issued to Cognate in lieu of cash was $10 million per quarter. Had the latter been paid in cash, the quarterly cash burn rate would have been $30 million instead of $20 million. Management has not issued any guidance for cash burn in 1Q, 2016 or subsequent quarters. I think that the halt in screening may have reduced the burn rate meaningfully, but I can only guess at how much. If the required cash burn rate is $23 million per quarter (it was $30 million in 2015) and Cognate accepts cash and stocks in lieu of cash similarly to 2015, the actual cash outflow would be about $15 million per quarter. Hence the cash balance could carry Northwest into early 3Q, 2016 if these guestimates are roughly correct. How Much Cash Will Northwest Need Over the Next Year or So? Any way you look at it, Northwest will have to raise significant amounts of cash through the balance of 2016 and on into 2017. My guess is that to complete the phase 3 trial of DCVax-L and to execute the phase 2 trials of DCVax-L combined with a checkpoint inhibitor and the DCVax Direct trials in inoperable solid tumors, that the Company could burn $30 million per quarter. Let’s further assume that this rate of burn starts with the beginning of 3Q, 2016 and the company at that time would have about $2-$5 million of cash on hand (this assumes the over-allotment is not exercised. This would mean that the Company will need to raise about $120 million in to fund operations through the period from July 1, 2016 to June 30, 2017. Assuming the over-allotment in the February 29 offering is exercised, there would still be a need for another $105 million. Although these numbers give the appearance of great precision, I hope that you realize they are only ball park numbers. What is the Current Fully Diluted Share Count? The number of shares outstanding at the end of 2015 was 95.9 million shares. The number of potential additional dilutive shares was 17.0 million, which was comprised of 13.6 million warrants, 1.6 million options and 1.8 million shares from a convertible security. Please note that the actual number of warrants outstanding was 27.2 million, but I only included the 13.6 million warrants with a reasonable chance of being exercised. Hence, the fully diluted share count at the end of 2015 was about 112.6 million shares comprised of 95.6 million issued shares and 17.0 million additional shares potentially from warrants, options and shares issuable for convertible notes. The February offering increased the number of shares outstanding by 5.9 million to 101.5 million and the issuance of an additional 3.0 million warrants brings the number of potentially dilutive shares to 20.0 million. Hence, the current fully diluted share count is 121.5 million. If the overallotment is exercised there will be an additional 5.9 million shares and 3.0 million warrants bringing the fully diluted share count is 130.4 million. What Is Going to Happen with Share Count? There is the potential for a significant number of new shares and warrants to be issued and the critical question is how many and at what price. I think that if the phase 3 trial for DCVax-L resumes screening and the new trials begin that the stock price could exceed the current price of $1.50, Northwest at the current prices of $1.50 has a market capitalization of just $182 million based on 121.5 million fully diluted shares. So how many more shares and warrants could be issued over the coming year? Let me make the assumption that the Company will have to raise $120 million. Let’s further assume that Cognate is paid only in cash for its manufacturing services and that the over-allotment is not issued. Let’s further assume that the cash is raised at a price of $1.50 and that there is 50% warrant coverage. I hope that these are very, very conservative assumptions, but we shall see. With these assumptions, the company would have to issue 80 million new share and 40 million new warrants. Hence, one year from now there would be 201.5 million shares and 60.0 million potentially dilutive shares bringing the fully diluted share count to 261.5 million shares. If the money were raised at an average price of $3.00 instead of $1.50 the fully diluted count would be 181.5 million and if it were raised at an average price of $5.00 the fully diluted share count would be 157.5 million. The current market capitalization of $182 million is based on a price of $1.50 and fully diluted shares of 121.5 million. The potential stock price one year out obviously will be dependent on the market capitalization and number of shares outstanding. The current market capitalization seems to assume there is only a modest chance for success in the phase 3 trial for DCVax-L and/or in the phase 2 trials of DCVax-L or DCVax Direct that are poised to begin. If the DCVax-L trial fails or investors come to the conclusion that it will fail, the market capitalization will be very small. There would still be the chance that information gained in the trial would allow a future trial that could be successful, but such a trial would take four or five years. The success of DCVax Direct is independent of what happens to DCVax-L but it might be very difficult to fund the trials. Iin this scenario, I think that market capitalization would drop to $20 million or so. This is the downside. I think that if one year from now, top line results are not in but DCVax-L is judged to have a reasonable chance of success and the phase 2 trials with DCVax-L and DCVax Direct are ongoing, that the market capitalization could be $500 million to $1 billion. Remember that this broadly describes the current market view of Kite and Juno which have market capitalizations of $3.7 billion and $2.1 billion respectively. If DCVax-L does succeed in phase 3 and the phase 2 trials of DCVax-L and DCVax Direct are viewed optimistically, the market capitalization could be $5 billion. You can see that there are all kinds of possibilities for fully diluted share count and market capitalization one year from now that will determine the stock price. I have put together the following table to help view the possibilities.The market capitalization assumptions range from $20 million to $5 billion and the fully diluted share count assumptions range from 157.5 million to 261.5 million. I am not offering the probability for each of these combinations to occur. Hopefully with a known outcome on whether screening will resume in the phase 3 trial of DCVax-L, I can make a stab at probabilities. The body’s natural response against cancer is the immune system. The most exciting area of current drug development for treating cancer is immuno-oncology that emulates certain anti-cancer activities of two key cells of the immune system: B-cells that produce antibodies and killer T-cells. In humans, classes of these cells are trained by the adaptive immune system to identify and attack specific molecules on cancer cell surfaces called antigens which identify the cancer cell as being foreign. The activation of B-cells and T-cells is controlled primarily by the dendritic cell, which is the quarterback of the natural immune response to cancer. The first great breakthrough in immuno-oncology occurred in the late 1970s with the introduction of monoclonal antibodies which target a specific antigen on a cancer cell. This has produced multi-billion dollar blockbuster products such as Rituxan, Avastin, Herceptin, and several others. Indeed, Genentech was built on monoclonal antibody technology. The next great commercial success promises to be checkpoint modulators. These are monoclonal antibodies that target receptors on killer T-cells that greatly enhance the cancer fighting ability of these cells. The lead drug in this category is Bristol-Myers Opdivo which was introduced in 2015; sales were $945 million in 2015 Wall Street consensus sales expectations for this product are $15 billion in 2020. Merck’s Keytruda was also introduced in 2015 and achieved sales of $570 million with and consensus expectation of $7.5 billion in 2010. Within the last two years, enormous excitement has been created by CAR-T cells. These have produced dramatic responses in late stage blood tumors which were unresponsive to all other treatments. These are T-cells that are taken from the body and genetically engineered to express a receptor that hones in on a cancer antigen. They are then returned to the body. CAR-T cells combine the specificity of a monoclonal antibody with the killing power of a T-cell. The three leading companies in this area are the big pharma company Novartis and two emerging biotechnology companies Juno and Kite. Each of these companies are conducting small, open-label phase 2 trials that are enrolling desperately ill patients who have no other treatment options. The Companies believe that if clinical effects seen in phase 1 trials are replicated that the drugs can be approved without the need for larger confirmatory trials. If all goes well, the CAR-T drugs from these three companies could be approved in 2017 or 2018. Monoclonal antibodies and CAR-T cells target a specific antigen on a cancer cell. While this has proven to produce significant therapeutic responses there is a major drawback. The selected antigen target may not be highly expressed initially on cancer cells or may disappear as a result of mutation. The checkpoint modulators enhance the activity of numerous types of killer T-cells and, may have a broader effect, but clinical results show that they are effective in only 20% to 30% of patients. The limitation of monoclonal antibodies, checkpoint modulators and CAR-T cells is that they are rifle shot approaches using just one or a few cancer fighting aspects of the immune system. The natural immune system employs perhaps hundreds or thousands of approaches which work in concert. It seems to me that a product that could target all of the antigens in a cancer and cause more widespread involvement of the immune system would be a much more promising approach. So how can we accomplish this? The dendritic cell is the quarterback of the immune system. Its natural role in the body is to phagocytize cancer cells, capture multiple (all) cancer antigens that are expressed by the cancer and display them on its cell surface. This display can mobilize all components of the immune system, the B-cells, T-cells and other components. The technology of DCVax-L is based on removing monocytes from the body which are precursors to dendritic cells. These are then matured into dendritic cells, engineered in the case of DC-Vax-L to express all cancer antigens and then returned to the body. The great promise of DCVax-L is that it is shotgun approach rather than a rifle shot. I am just a layman with limited understanding of molecular biology, but this suggests to me to offer potential substantially beyond current immuno-oncology approaches. Critics might question why if the dendritic cell technology is so promising, there aren’t any big biopharma companies rushing in by beginning programs on their own or acquiring small companies with industry leading positions. That is a very good question which I can only answer by looking at history. The monoclonal antibody era was heralded in by the launch of Rituxan in 1997. The major pharma companies ignored the technology for over ten years before making it a major focus. As late as five years ago, the checkpoint modulators were ignored by almost every major biopharma company with the exception of Bristol-Myers Squibb. Now they are tripping over themselves to gain a position. The CAR-T cell technology has been around for over 15 years (about the same as the dendritic cell technology) but was largely ignored because of manufacturing and toxicity issues. Then venture capital firms put together companies based on research done at academic centers and NIH and with a lot of hype formed Juno and Kite. A good deal of hype excited investors. Against this backdrop, the lack of big biopharma development interest in dendritic cell cancer vaccines to this point is understandable based on their past behavior. My personal feeling and remember that I am not trained in molecular biology is that dendritic cell cancer vaccines could ultimately prove to be the most important of all of the immuno-oncology technologies. The above argument is a theoretical argument and I have found that theoretical biology can be remarkably unpredictive of eventual clinical outcomes. The only true measure of a drug is clinical trial data, although given the vagaries and difficulties in conducting clinical trials, even this is not always predictive. That said, let’s look at clinical data supporting DCVax-L. In a phase 1/2 trial of 20 patients with newly diagnosed glioblastoma, the results showed that median overall survival (OS) was 36.4 months and median progression free survival (PFS) was 26.4 months. PFS is the length of time from start of treatment to the time when the cancer begins to grow again. Studies necessary for regulatory approval usually but not always, require that the drug being studied be combined with standard of care (SOC) in one arm of the trial and compared to standard of care in the other arm. Obviously, the new drug has to meaningfully improve results over SOC to gain regulatory approval. Most early studies like this phase 1/2 trial are primarily intended to establish safety and perhaps provide signals of efficacy that will allow the drug to progress to larger, controlled trials. They typically do not have SOC arms and this makes interpretation of results more circumspect. The lack of a control arm means that results can only be compared to results with SOC arms from other studies. I looked at four large studies that showed that expected OS for standard of care in newly diagnosed glioblastoma was 14.6 to 17.0 months. The improvement of DCVax-L as compared to historical results was 19.4 to 21.8 months. How good is this? Generally, a drug which improves OS by 4.0 months in aggressive cancers like glioblastoma is considered a major advance. Again, I want to strongly emphasize that experience teaches that results from small, early stage trials such as the DCVax-L phase 1/2 trials are not always replicated in larger trials. Still this was a very strong signal of activity. Progression free survival in these 20 patients was 26.4 months versus 6.2 to 8.1 for historical controls. The endpoint of the phase 3 trial for DCVax-L is progression free survival and according to the statistical plan would be successful if the difference between the DCVax-L plus standard of care arm and the standard of care arm is 4.0 months. I’ll discuss this in more details later in this report. Some have wrongly questioned progression free survival as a primary endpoint, but it is used frequently in cancer trials for aggressive, refractory cancers like glioblastoma. The key issue for a primary endpoint is whether it is medically significant and in the case of glioblastoma, the answer is definitively yes. Glioblastoma is a rapidly growing cancer that is confined to the skull and as it grows it squashes other parts of the brain causing severe headaches, convulsions and interference with normal functions controlled by the brain. It can actually push the brain down the brainstem. PFS is a very meaningful primary endpoint for glioblastoma. Another important insight into the potential efficacy of DCVax-L comes from the ongoing phase 3 trial. The trial protocol calls for excluding rapid progressors from the phase 3 trial. These are patients who have been surgically resected and given radiation and perhaps temozolomide but have not yet received DCVax-L (which is started a few weeks after radiation therapy is completed). In rapid progressors, their cancers have started to regrow before DCVax-L therapy is started. Bear in mind that the primary endpoint is progression free survival for the phase 3 trial so that because the cancer already was progressing, these patients would have failed the trial before they even entered it. These rapid progressors were excluded from the phase 3 trial, of course, but they were still given DCVax-L treatment. Bear in mind two things. First of all, these patients are much sicker and at much greater risk than patients enrolled in the phase 3 trial and would be expected to have shorter survival times (some small studies suggest on the order of 8 to 12 months). Also as a point of reference for judging results in the information arm, remember that the median overall survival for healthier patients who haven’t relapsed and were enrolled in the phase 3 trial is 14.6 to 17.0 months. In this context, the data presented from the information arm is extremely encouraging. Of the 25 patients treated, 18 (72%) have lived longer than 15 months and 10 (40%) have lived longer than 3 years. There is supporting evidence aside from results with DCVax-L that suggest that dendritic cell vaccines are effective. The FDA approved Dendreon’s Provenge for metastatic prostate cancer in 2009 based on a very impressive 4.2 month improvement in OS. Dendreon went bankrupt and some investors attributed this to Provenge being a failure. However, the bankruptcy of Dendreon resulted from the Company aggressively expanding marketing and manufacturing infrastructure to support a level of sales three times higher than was achieved. It was bad planning on the part of management rather than ineffectiveness of Provenge that caused the bankruptcy. Unfortunately, Provenge was launched at the same time that Johnson & Johnson and Astellas launched two small molecule drugs, Zytiga and Xtandi with comparable OS results in metastatic prostate cancer. Provenge’s marketing message was overwhelmed in the wake of massive marketing efforts from JNJ and Astellas. Management had built the Company on the expectation that sales would quickly reach $1 billion and had built up massive amounts of debt to finance its marketing and manufacturing efforts. Within three years, Provenge built sales to $300 million and has plateaued at this level. This was respectable in an absolute sense, but this level of sales couldn’t service the debt. (In a side note, Valeant recently acquired Provenge.) I would submit that in the totally hypothetical scenario in which Provenge was in the hands of a larger, more competent company and Zytiga and Xtandi were not launched at the exact same time, that Provenge could have been a $1 billion drug. I would also point out that ImmunoCellular’s ICT-107 is a dendritic cell cancer vaccine that like DCVax-L is targeted at newly diagnosed glioblastoma. A small phase 2 study failed to reach the primary endpoint of median overall survival, but sub-group analysis showed very significant activity in specific sub-groups and ICT-107 is now in a phase 3 trial. The German and UK regulatory agencies have made DCVax-L available to patients in those countries prior to completion of the phase 3 trials. Both regulatory agencies are trying to make promising drugs like DCVax-L that are targeted at life threatening diseases available before phase 3 results are available. All of this data is very encouraging and I am hopeful that the phase 3 results replicate what has been seen in the phase 1/2 trials and information arm of the phase 3 trial. Still, as I have pointed out over and over, results from small trials are not always replicated in larger trials. Also, I have seen many trials fail because of the design of the trial and/or its execution so there is also that risk. I am hopeful that DCVax-L will be successful in its phase 3 trial but it is obviously a high risk trial. Is Progression Free Survival an Acceptable Endpoint? The primary endpoint in the phase 3 trial is progression free survival and a key secondary endpoint is overall survival. The trial protocol allows patients in the standard of care arm to be given DCVax-L once their cancer progresses (starts growing). This means that most/ many patients in the control arm will also be receiving DCVax-L at some (later) time in the trial. Obviously, this confounds interpretation of overall survival results. Some critics have argued that progression free survival is not an acceptable endpoint. This is incorrect as many cancer drugs, notably the checkpoint modulators Opdivo and Keytruda and the CAR-T products, use either PFS or objective response (degree of tumor shrinkage) and not OS as a primary end point in some trials. The viability of an endpoint depends on how medically meaningful it is. In the case of glioblastoma, progression free survival is enormously important. This is an aggressive cancer growing in the confined space of the skull. As it progresses or expands, it impinges on other areas of the brain causing devastating side effects, notably convulsions and severe headaches. It can actually push parts of the brain down the brain stem. Any drug that can provide a meaningful lengthening of the time to progression in glioblastoma will be quickly approved and embraced by the medical community. The phase 3 trial of DCVax-L is designed to show statistical significance if DCVax-L can improve progression free survival by 4.0 months. Let me put this in perspective. Four well controlled trials have shown that progression free survival with standard of care 6.2 to 8.1 months. Hence, DCVax-L probably would have to show PFS of around 12 months to be successful on a statistically significant basis. As a point of reference, in the phase 1/2 trial of DCVax-L in 20 patients the progression free survival was 26.2 months. What About Overall Survival, a Secondary End Point? Let’s turn now to interpreting overall survival in the phase 3 trial. I previously mentioned that data from four relatively large studies showed that median overall survival for standard of care ranges from 14.6 months to 17.1 months. This means that half of patients are dead in this time frame. When standard of care patients’ progress, they can be given DCVax-L. This obviously confounds the trial analysis because patients who were given DCVax-L from the beginning of the trial are compared to patients in the standard of care arm who received DCVax-L later in the trial. In interpreting, the phase 3 results on overall survival the FDA would obviously want to see an improvement in median overall survival for DCVax-L versus historical data and also against the control arm of the trial (remember the control arm also receives DCVax-L). The historical data suggests that median overall survival for standard of care should be between 14.6 and 17.1 months (average of 16.1 months). So want would the results in the DCVax-L arm have to be to be meaningful. In aggressive, difficult to treat tumors a 4.0 month improvement in median overall survival is considered a significant therapeutic advance so on this basis median overall survival of 20 months or better would be very positive as this would be roughly a four month improvement over historical results. I note that some drugs have been approved for highly aggressive cancers on the basis of as little as 1.5 month improvement in median overall survival such as gemcitabine in refractory pancreatic cancer. 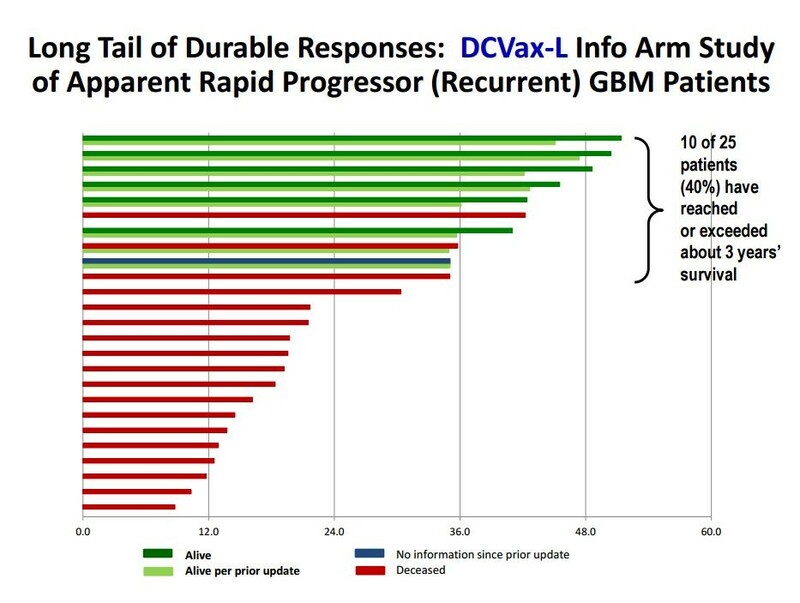 It is difficult to conjecture what OS results might look like in the control arm although we would want to see an improvement (probably for DCVax-L versus historical results. If the primary endpoint of PFS is reached and something like these data for overall survival are achieved the drug would almost certainly be approved. As a final note, I would point out that the statistical design of the trial calls for the enrollment of 348 patients. At the screening halt, the Company said that meaningfully more than 300 patients were enrolled in the trial. There is no way of knowing but this language suggests to me that the trial may have enrolled 320 or more patients. What would happen if the screening halt is not lifted so that not all 348 patients are enrolled and the analysis is based on 320? It could have an effect on the statistical analysis, how much or how little I can’t say. As a point of reference, the original study design called for enrollment of 312 patients. Confidential information about the trial was hacked by short sellers from a contract research organization and some was leaked on the web. This revealed that the study was 80% powered to show significance based on 312 patients enrolled in the trial if progression free survival showed a 6 month improvement over control. The resultant p value would have been 0.02 or less. The FDA approved an adjustment to the trial in 2014 that enlarged enrollment to 348 and the primary endpoint now requires a 4.0 months increase in progression free survival to be statistically significant. Let me start out by saying that I can’t come to a conclusion on why screening in the phase 3 trial was halted, when or if it might end and of course what the next steps might be. In this section, I am going to go over the possible scenarios, but none of them satisfactorily explain to me what is going on. There is an important piece of this puzzle that is missing. I would urge you to read my report Northwest Biotherapeutics: Thoughts on Suspension of Screening of New Patients in the Phase 3 DCVax-L Trial for a more in-depth discussion. My thinking hasn’t changed meaningfully since I published that report in September. Management has essentially been silent since the halt was announced. In an August press release they stated that that the screening was halted, but that patients already enrolled in the trial were continuing to be treated per the trial protocol. The press release went on to say that “The Company is in the process of preparing the trial information for regulatory review and anticipates submission within the next couple of weeks.” This implied that the data would be submitted by mid-September. They did not comment on what type of data was to be submitted. Since then, there has been no guidance or information from management. What Might Have Triggered The Halt in Screening; Probable DMC Involvement? Obviously, the key question is what triggered the halt? This is a blinded trial and no one with the exception of the Data Monitoring Committee (not the Company, FDA, clinical investigators or any other party) gets any information about the data being created as the trial progresses. I can only conclude that the halt in some way was tied to the DMC although I cannot exclude some “out of the box” explanation. The primary function of the DMC is to continually monitor the data for any signals of significant side effects to protect patients in the trial. In addition, at pre-specified times usually tied to a certain number of events (progression of the disease in the case of DCVax-L) the DMC may also do an analysis to determine whether: (1) the trial has already achieved statistical significance on the primary endpoint (2) the trial is unlikely to meet its primary endpoint and it is futile to continue the trial, or (3) the data does not indicate success or failure and the trial should continue. The overall trial could be halted before the scheduled completion point if the DMC analysis indicates either success or futility. However, the DMC is only an advisor and the Company makes the decision as to whether to halt the trial. It is not an absolute requirement that the Company confer with the FDA. Could There Somehow Be A Safety Concern? If the trial had a safety issue, it would be quite surprising as it started in 2007 and after a long delay due to lack of funding really began enrolling in earnest in early 2012. Safety issues would almost certainly have surfaced long before now. Also, there have been no safety issues reported with DCVax-L in phase 1 and 2 trials nor in other dendritic cell cancer vaccines trials of ImmunoCellular’s ICT-107 and Provenge. One of the hallmarks of dendritic cell vaccines is their very good safety profile. Also, if there were a safety issue, treatment for all the enrolled patients would have been halted. I think we can rule out safety concerns. Could The Screening Have Been Halted Because Efficacy Was Reached? It can be argued that the trial was halted because efficacy was reached at an interim look and this was brought to the attention of the FDA. This would explain why the FDA is involved but not so much the screening halt. As a stretch to explain the halt, we could hypothesize that the FDA suggested that it would be useful to let the data mature somewhat more. They might also want to look at information from early access programs in the UK and Germany, the compassionate use program in the US and other countries and the information arm of the DCVax-L trial. I can’t rule these issues out, but it doesn’t seem to explain the halt in screening. In this scenario, it seems to me that screening would have continued and the phase 3 trial completed. I don’t give this explanation much credence. Could The Screening Have Been Halted Because The DMC Determined It Was Futile to Continue? Some subscribers have suggested that the halt in screening was due to the DMC informing Northwest that it would be futile to complete the trial. Here is what one subscriber to SmithOnStocks suggested. “I believe that a second DMC review happened (Aug would have been 20 months AFTER the first DMC review) and that the DMC board halted the trial for futility and the Company chose to continue the trial to the end without disclosing this to investors.” This stopping for futility argument needs to be considered as an explanation for the halt in screening. Let’s consider some points. The DMC is an advisor to the Company and has no authority to halt the trial-it can only recommend this. Unless there is a safety issue, the Company does not necessarily have to stop the trial. Northwest would likely confer with the FDA if the DMC concluded that the trial was futile, but they could elect to continue the trial. It would not be illogical or sinister on the part of the Company as it consistently is the case in immunotherapy that a small percentage of patients (perhaps 20% to 30%) with durable responses drive the results and that the Kaplan Meier’s curves separate late in the trial. These characteristics could mean that median progression free survival calculated at an interim look is not predictive of what final results might be. This provides a strong incentive to complete enrollment and continue the trial. The FDA would want to give the trial every chance to succeed because of the urgent unmet medical need and the encouraging data on DCVax-L from other studies which I just talked about. I actually saw this type of situation occur in one other case. Cell Genesis halted a trial of its prostate cancer vaccine because there were more deaths in the drug arm than the control arm at an interim look. However, a major medical center continued to monitor the patients and the investigator watching the data has said that the curves have reversed and are now widening in favor of the cancer vaccine, i.e., there are less deaths in the drug arm than the control arm. This data has not yet been published; my information came from a presentation at a conference and speaking to the investigator afterwards. It cannot be corroborated with a published paper. However, I spoke at length with the investigator and have strong confidence that the information is correct. I also don’t know if the results are statistically significant. Importantly, the DCVax-L trial is stratified for many important variables such as MGMT methylation, degree of resection, immune status, etc. Even if DCVax-L does not reach statistical significance, there is much to be learned about glioblastoma sub-populations and this is a strong reason for continuing the trial. This could give meaningful information on how to design future trials in newly diagnosed glioblastoma with other drugs of perhaps a later trial of DCVax-L. The explanation that the screening has been halted somehow relates to a DMC recommendation has logical appeal. However, the strongest reason for FDA involvement and screening halt would be a safety issue and as I have discussed, there is little reason to believe there is a safety concern. This is puzzles me. The enrollment goal of the trial is 348 patients and the Company has indicated that meaningfully more than 300 patients (could this mean 320 or so) have been enrolled in the trial. In light of all of the factors that I have laid out, it doesn’t make sense that the FDA would want to halt screening and enrolling another 30 patients or so even if the DMC has recommended halting the trial for futility. I re-emphasize that the FDA and all interested parties have every incentive to give this trial a chance to succeed. I have put together these analyses based on what I know. However, none of my analyses adequately explains to me the FDA involvement and the screening halt. This leads me to believe that there is a very significant piece to this puzzle that is missing. I suspect that when all of the facts are ultimately known that there will be something profound that my analyses doesn’t consider. I think that the possibility that the trial will be halted for efficacy is very small and I also think that a recommendation to stop the trial and take enrolled patients off the drug is also very small. This leaves us with two possibilities. The first is that the FDA indicates that screening for enrollment should be continued and the trial completed. This would require enrolling another 30 patients or so. I think this would be considered as a positive. Investors would think that the FDA after carefully considering the data feels there is a good reason for continuing the trial. I think that investor reaction to this scenario would also be very much influenced if the reason for the screening halt is explained. The second scenario is that the FDA says that the Company should just let the trial complete and the data analyzed on the basis of the 320 or so patients enrolled instead of the trial’s enrollment goal of 348. This would likely be taken as a negative by investors who might conclude that the FDA feels enrolling more patients would not likely give the trial a chance to succeed. Northwest has been the subject of an intense campaign by hedge funds who have aggressively shorted the stock, to discredit Northwest Biotherapeutics’ dendritic cell technology base. In a previous section, I argued why I believe this could be a major advance in the treatment of cancer. These same short sellers have also disparaged the quality of the data for DCVax-L. In this section, I compare the data and some other important information pertinent to DCVax-L to that generated by the two leading biotechnology companies involved in CAR-T, Juno and Kite. I won’t attempt to compare in great detail the CAR-T technology to dendritic cell cancer vaccines. This is far beyond my ability and both technologies are so early in development that it is difficult to project their promise. In my opinion, both are potential breakthroughs in the cancer treatment paradigm and yet Northwest Biotherapeutics is valued at $182 million while Juno and Kite have market capitalizations of $3.7 billion and $2.1 billion. Let’s take a look at the arguments that have been used to attack Northwest and see how these might or might not apply to Kite and Juno. Let’s examine some of the criticisms made by short sellers. Critics argue that the DCVax-L results in phase 1/2 are based on only 20 patients and that Northwest is irresponsible in starting a phase 3 trial based on this data. However, the lead phase 2 trial of Juno is based on data from 32 relapsed/ refractory, pediatric patients with acute lymphoblastic leukemia (ALL). Similarly, the lead trial of Kite in DLBCL/ PMBCL patients is based on results from 27 patients in phase 1. Both companies are representing that if these phase 2 trials are successful, their drugs will be approved. The DCVax-L phase 1/2 trials was open label and had no control arm. The phase 1 trials of Juno and Kite were also open label. It is also important to understand that the phase 3 trial of DCVax-L has a control arm while the Juno and Kite phase 2 trials do not. The DCVax-L phase 3 trial primary endpoint is progression free survival. Critics maintain that only overall survival is acceptable as an endpoint. I have previously pointed out that PFS is medically relevant and an acceptable primary endpoint. The primary endpoint of the Juno and Kite phase 2 trials as was the case in phase 1 is objective response rate (shrinkage of size of the tumor), duration of response and safety-not overall survival. Overall survival is a secondary endpoint for the Juno and Kite trials as it is for the DCVax-L phase 3 trial. There are 348 patients scheduled to be enrolled in the phase 3 trial of DCVax-L. The Juno and Kite phase 2 trials will enroll 112 patients and 70 patients respectively. The manufacturing process of Northwest is based on autologous cell therapy in which living cells are removed from the patient and then returned. Shorts argue that this manufacturing process is so high cost that it can never be profitable. Kite and Juno’s products are also autologous cell therapies. The phase 1/2 results of DCVax-L were compared to historical results. On this basis the impressive improvement in median overall survival is meaningless in the opinion of the shorts. However, the Juno trial showed a complete response rate of 91% which was compared to historical results of 10%. In Kite’s phase 2 trial it is enrolling patients on the basis of phase 1 data in 27 patients of whom 13 had complete responses and 19 had an objective response. There is not good historical data. Based on all available data the side effects of DCVax-L are injection site reaction and fever that can be treated with Tylenol. In the phase 1 trials of Juno and Kite about 25% of patients suffered from cytokine storms and another 25+% from severe neurotoxicity. These were grade 3/4 side effects that were life threatening. Indeed, some patients treated with CAR-T cells have died. There are many other points of comparison that I can bring up, but I think these substantiate the point that I am trying to make. The data pertaining to Northwest is every bit as impressive as that presented by Kite and Juno. I see both approaches as very promising and yet Northwest is valued like a company with a failed technology. I think the answer to this lies in the unprecedented degree of stock manipulation that has been targeted at Northwest. I think that dendritic cell cancer vaccines have the potential to be a major advance in the treatment of cancer. In order to put my thoughts in context, it is important to look at how cancer treatment has progressed over the last 70 years and how they attack cancer. This gives an insight into the potential major therapeutic advance that dendritic cell cancer vaccines may afford. Cancer is a disease in which mutations result in abnormal cells that replicate uncontrollably. The ever growing tumor mass impinges on and damages nearby cells and in many cases tumor cells dislodge from the primary tumor to travel through the blood and lymph system to lodge in other organs of the body where they form new sites of tumor (metastases). Tumors occur in virtually all types of cells and are usually referred to by the organ (breast cancer, prostate, lung e.g.) or cell (non Hodgkin’s B-cell lymphoma e.g.) in which they occur. There are hundreds or perhaps thousands of different cancers that differ by the cell type in which they occur and the many mutations that can cause these cancers. It is misleading to think of cancer as a single disease. Let’s turn now to treatment. Surgery is extremely important in cancer treatment. If the primary tumor has not metastasized and can be completely removed surgically, the cancer is cured. Even if the tumor has metastasized, removal of much of the tumor can extend life. Surgery is very often the first step in treating various cancers. Radiation is also important; when directed at cancer cells it can destroy DNA and is more selective for rapidly dividing cells like cancer than normal cells. Both of these therapies are primarily directed at the primary tumor site. The first great advance in using drugs to fight cancer was chemotherapy. As a generality, these drugs kill cancer cells directly. They drugs generally target and destroy rapidly dividing cells like cancer more than normal cells, but they do also attack and damage or destroy normal cells. These drugs are essentially poisons so that the key is giving enough drug to kill a great number of cancer cells without killing or causing damaging side effects in the patient. To illustrate this, the first chemotherapy drug introduced in the late 1940s was nitrogen mustard which was used as a poison gas in World War I. There are certain types of cancers that are driven by hormones such as estrogen in breast cancer and testosterone in prostate cancer. They can accelerate the growth of a tumor. Hence agents which block them from stimulating the cancer cells can slow the progress of a tumor. These agents came into widespread use in the 1970s. Surgery, radiation, chemotherapy and hormonal therapy all play major roles in the treatment of cancer, but they are limited in efficacy and have side effect issues. Beginning in the 1970s researchers began to look at another way of treating cancer. The immune system in human beings has a primary role of detecting and destroying bacteria, viruses, parasites and other infectious agents. However, it can also recognize and destroy abnormal cells like cancer cells. The immune system is comprised on an innate system that acts as the first shield against infection using generalized mechanisms of action. This then alerts and triggers the adaptive part of the immune system that creates and grows cells that target particular aspects of cancer cells. Two key cells of the immune system are B-cells which secrete proteins called antibodies that can selectively target molecules (antigens) that appear on cancer cells. The second type of cell is the T-cell of which there are several types with various functions. Ultimately, a type of T-cell is produced (killer T-cell) which recognizes an antigen on a cancer cells. It attaches to that antigen and secreted cytokines that cause holes in the cancer cell membrane and destroy it. Research efforts which seek to duplicate some, many or all aspects of the immune system to treat cancers are called immunotherapies. The first great immunotherapy breakthrough was the development of monoclonal antibodies. This technology is based on finding an antibody that specifically targets an antigen on a cancer cell. This antibody is produced in great quantities as a cancer drug. Rituxan which was introduced in 1997 heralded the beginning of the age of monoclonal antibodies and the creation of multi-billion dollar blockbuster cancer drugs such as Avastin, Herceptin and Erbitux. Currently, the bulk of cancer drug development efforts center on monoclonal antibodies. In the 2000s, another area of drug research began to produce some very important new drugs which are called targeted therapies. These drugs were made possible by advances in molecular biology that allowed the identification of specific cellular processes that allowed cancer cells to grow rapidly and blocking their action. These drugs represented a more specific way of killing cancer cells rather than the shotgun approach of chemotherapy and in specific cases resulted in significant improvement in cancer therapy. Like chemotherapy, these drugs have off target effects (attack normal cells that display the antigen they are targeting). These represent an evolutionary advance over chemotherapy. Despite the success of the monoclonal antibodies, there was surprisingly little interest by the large bio/pharma companies on other approaches to using immunotherapy so that much of the research was led by small, entrepreneurial biotechnology companies. This has led to the next round of drug development and that is checkpoint modulators. T-cells have receptors that when engaged by certain molecules can cause the proliferation of T-cells or turning down their action. Cancer cells have been to develop molecules that act on these receptors on T-cells. For example, they can engage with receptors such as PD-1 and CTLA-4 on T-cells and in doing so they inhibit the ability of T-cells to divide and attack cancers. This essentially puts the brakes on the immune system. Research has now developed monoclonal antibodies that attach to PD-1 and CTLA-4; these do not activate or downregulate those receptors but block cancer cell molecules from acting on them. They essentially take the brakes off the immune system. There are other receptors when that when activated have the exact opposite effect on T-cells and accelerate their response. There are three drugs now on the market: Bristol-Myers Yervoy (anti-CTLA-4) and Opdivo (anti-PD-1) and Merck’s Keytruda (anti PD-1). The lead drug in this category is Bristol-Myers Opdivo which was approved in the US in December 2015; sales were $945 million in 2015 and Wall Street consensus sales expectations for this product are $15 billion in 2020. Merck’s Keytruda was approved in October 2014 and achieved sales of $570 million in 2015; consensus expectation are $7.5 billion in 2020. Yervoy was introduced in 2010 and had sales of $1.1 billion in 2015 down from $1.3 billion in 2014; its sales are being cannibalized by Opdivo and Keytruda. In the last two years, Wall Street has become fascinated with chimeric antigen receptor T-cells (CAR-T). Remember that the adaptive immune system creates killer T-cells that have receptors that allow that T-cell to detect, attack and destroy cancer cells which have antigens to which the T-cell receptor attaches. The CAR-T technology involves removing T-cells from the body and inserting a gene that causes the expression of a receptor on that T-cell that is specific to an antigen. There are three leading companies in CAR-T development: Novartis, Juno and Kite. All three companies have CAR-T drugs that target the CD19 antigen on B-cell cancers such as refractory acute lymphocytic leukemia and refractory non-Hodgkin’s B call lymphoma. These companies are essentially in phase 2 development trials which they hope can be used to gain regulatory approval because of the severity of the cancers they address and the lack of any treatment options. Tiny Northwest is a leader in the development of dendritic cell therapeutic cancer vaccines. I have gone through this history of cancer treatment and the rise of immunotherapy to put the technology of Northwest Biotherapeutics in perspective. It is important to understand the critical role that dendritic cells play in the immune system. Dendritic cells capture (phagocytize) cancer cells, break them into components, some of which (cancer antigens) are displayed on their surface. Passing helper T-cells recognize these antigens as foreign and mobilize into action the overall immune system, including T cells, B cells and their antibodies, natural killer cells of the innate immune system and many other immune responses. Northwest and a few other small companies are trying to replicate the action that in nature stems from the immature dendritic cell capturing antigens, migrating to the lymph nodes and differentiating into a mature dendritic cell that displays that antigen to T cells and B cells. This trains the T cells to recognize and attack cells bearing this antigen, and B cells to produce antibodies to the antigen. In nature, this is an incredibly complex process. The manufacturing approach of Northwest starts with the removal of monocytes from the body. This type of cell is a progenitor cell which in a series of stages differentiates into a dendritic cell in the body. Northwest’s manufacturing process moves monocyte along this process. At certain stages of differentiation, the cells are exposed to cancer antigens from the patient. At the time of surgery, parts of the tumor are sent to the manufacturing site. This sample is then lysed and presented to the dendritic cell that takes up the antigens that are present in the patient’s cancer. The dendritic cell is the returned to the patient in a subcutaneous injection. It travels to the lymph node and presents these antigens to circulating helper T-cells with the therapeutic goal of mobilizing a broad based immune response against the cancer. Cancer vaccines have had a history of failure including those that make use of the dendritic cell. Many of the therapeutic vaccines for cancer have targeted existing dendritic cells in situ in a patient’s body, by administering various compounds or factors that are designed to attract dendritic cells to the tumor or enhance the tumor signals to the dendritic cells (in essence, making the tumor signals louder). The Northwest approach is quite different from these. I am a layman when it comes to immunotherapy and I caution readers that the above comments much be viewed in such a context. To say that I am over-simplifying is an understatement, but I hope that I have presented a broad outline for other lay readers. With that considerable caveat, it appears to me that technology dealing with the dendritic cell has enormous potential. Because of its quarterbacking role in mobilizing the immune system, it could prove to be more important than monoclonal antibodies, CAR-T cells or targeted therapies. Obviously, it is early days but this strikes me as an incredibly promising approach. I must again caution that even if this approach is as promising as I believe, it is not always the case that pioneers like Northwest will be the first to successfully develop it. The previous section was descriptive of biology of immune-oncology and one can look at this and hypothesize all types of outcomes for the various immunotherapies under development. Unfortunately, I have found that theoretical biology is remarkably unpredictive of actual outcomes when drugs are tested in humans. I listen with respect to the scientists and physicians who work in immunotherapy and their predictions on what drugs they are researching will do in the clinic. However, I find that they are often wrong. My motto is in vivo veritas which essentially means that clinical trial data should be primarily relied on to judge the effectiveness of drugs. That said, let’s turn to the clinical data on DCVax-L.
A phase 3 trial of DCVax-L in newly diagnosed glioblastoma multiforme was begun based on very encouraging results from two phase 1/2 trials. Like many phase 1/2 trials, these involved a small number of patients (20), had no control arm and were done at a single clinical site (UCLA). Seasoned biotech investors will quickly point out that historical experience shows that such studies may not be replicated in larger studies. There can be unintended bias in small studies in patient selection and other factors that lead to unusually good outcomes. One of my cynical friends expresses this by saying that phase 3 results never look as good as phase 2. I understand this and I initially viewed the phase 1/2 trial results with conventional skepticism, but as I looked closer, I found the results just too striking to ignore. Investors often get excited with cancer drugs being studied in phase 1/2 studies in difficult to treat cancers (like glioblastoma multiforme) if they show objective responses (defined as shrinking the tumor mass by more than 50%) in 30% to 40% of patients treated. Moreover, one complete response (all signs of the tumor go way except for scar tissue) will often be exciting enough to cause companies to go into larger trials. This shrinkage of the tumor usually but not always suggests that the drug has biological activity that warrants further study. These very early trials are primarily intended to determine safety, gain insight into the correct dose and hopefully give a signal that there is biological activity against a cancer. It is very rare to see data on the effect on survival or progression free survival (how long it keeps the cancer form beginning to grow again.) What makes the phase 1/2 data striking so striking for DCVax-L is that it shows remarkable signals of activity in terms of improving progression free survival and overall survival. One of the significant issues with this data is that there was not a control arm in the study. DCVax-L results can only be compared to historical results from other trials. This is a significant drawback for the data although the absence of a control arm is almost always the case for early stage trials. With these considerable caveats, comparing DCVax-L results to historical standard of care data is quite encouraging. Let’s take a look at comparisons with historical results with standard of care from other trials. One comparison that can be made is to look at 119 patients (matched pairs) treated with standard of care at UCLA in the same time period as the DCVax-L trials. The matched pairs and DCVax-L were matched for age, gender, Karnofsky score (how ill they were), and extent of surgical resection. The matched pair group received standard of care and the DCVax-L group received DCVax-L added to standard of care. Standard of care is defined as surgical resection followed by radiation followed by use of the chemotherapy drug temozolomide. There are also three other well-conducted clinical trials to consider. The Stupp trial (published in 2005) first established what is now standard of care for newly diagnosed glioblastoma by comparing it to the then standard of care at the time, which was surgical resection followed by radiation. There were also two large trials (published in 2014) that compared Avastin plus standard of care to standard of care. These were the Gilbert and Chinot trials which showed results for standard of care. We have good data from four separate studies which informs us on what on what we can expect standard of care to deliver in terms of median overall survival and median progression free survival. I compare results from these four sources to the data from the phase DCVax-L trial in the following table. The comparison is strikingly positive for DCVax-L. Median overall survival for standard of care in the four trials showed was consistent and ranged from 14.6 to 17.0 months while DCVax-L was at 36.4 months. Similarly progression free survival ranged from 6.4 to 8.1 months while DCVax-L was at 26.4 months. Of great interest to me is the long term survival data. The Stupp trial showed that 3% of patients lived for five years while DCVax-L showed 27% rate of survival at six years. This is consistent with what we have seen in many immunotherapies in which about one-third of patients have a very impressive, durable response. Another important insight into the potential efficacy of DCVax-L comes from the ongoing phase 3 trial. The trial protocol calls for excluding rapid progressors from the phase 3 trial. These are patients who have been surgically resected and given radiation and perhaps temozolomide but have not yet received DCVax-L (which is started a few weeks after radiation therapy has completed). In these patients, their cancers have started to regrow before DCVax-L therapy is started. Bear in mind that the primary endpoint is progression free survival for the phase 3 trial so that because the cancer was progressing, these patients would have failed the trial before they even entered it. These rapid progressors were excluded from the phase 3 trial, of course, but they were still given DCVax-L treatment. The survival results are shown in the next table. Bear in mind two things. First of all, these patients are more at risk than much sicker than patients in the phase 3 trial and would be expected to have shorter survival times (perhaps on the order of 8 t 12 months). Second, as I previously discussed current standard of care can be expected to produce 14.6 months of median overall survival. In this context, the data presented in the following chart is extremely encouraging. Of the 25 patients treated, 18 (72%) have lived longer than 15 months and 10 (40%) have lived longer than 3 years. For a much more in-depth discussion of these results, please refer to my report Northwest Biotherapeutics: Promising New Data Was Just Presented on DCVax-L in Recurrent Glioblastoma Multiforme. It is encouraging that there has already been one FDA approved dendritic cell vaccine. Provenge was approved in April 2010 on the basis of showing a 4.3 month improvement in median overall survival in metastatic prostate cancer. Generally, a four month increase is considered a significant advance. Investors have looked at Provenge as a commercial failure because Dendreon went bankrupt. However, in a period of two years, Provenge sales reached $300 million. The Dendreon bankruptcy was brought on by Dendreon formed a large sales force and built capacity in anticipation of sales reaching over $1billion in about that time frame. They financed this enormous marketing and manufacturing expansion with debt and the $300 million of sales were unable to service the debt, hence bankruptcy. Immunocellular is developing ICT-107 which is the nearest competitor to DCVax-L. The major difference between the two products is that IMUC loads its dendritic cells with six pre-selected antigens characteristic of glioblastoma while DCVax-L is exposed to and presumably expresses most/ all of the antigens in the tumor. A phase 2 trial of ICT-107 failed to reach its primary endpoint of overall survival probably because the study was too small and underpowered. However, there were very encouraging signs of efficacy in certain sub-groups and based on this ICT-107 is now engaged in a phase 3 trial. See my report ImmunoCellular Has Plans to Move ICT-107 Forward into Phase 3 Trials; Should It? for more detail. The German and UK regulatory agencies are trying to give patients access to promising drugs used in life threatening disease before these drugs have completed phase 3 trials. Both agencies selected DCVax-L for these programs based on the phase 1/2 data and compassionate use data. I guesstimate that DCVax-L has been used about 20 to 30 times as compassionate use. I regard these actions as important third party validation of the promise of the drug. I am not going to go into detail in this report, but I would refer you to my reports What the 2014 10-K Had to Say about the Approval of DCVax-L under the German Early Access Program and Exciting News on Potential for Early Patient Access for DCVax-L in the UK for more detail. This is a very impressive analysis of all the issues. Congratulations! You have provided your readers with an understanding of all the clinical, commercial and financial issues that they will not get anywhere else. 1) When cancer metastasizes to different locations, it does so in mesenchymal form. 2) These cells are more likely to respond to DCVac-L treatment. 3) Glioblastoma are more likely to transition to the mesenchymal subset upon recurrence. How much do you think this weighs on the scales for FDA approval? The FDA would only consider this for approval if it were a prospectively defined endpoint and I don’t think it is.However, if the statistical significance is not that strong or marginally missed, it could be a tippping factor. “Flipper44” on IHub, relayed by Sentiment on YMB found this gem: Dr. Prins presenting in Seattle. The whole thing is pretty darn instructive; And then, around minute 19, Dr Prins let one big fat cat out of the biotech bag: Looks like a collaboration with BMY and Merck on CI is in the cards! Your take is more than welcome! Have you seen the conference on you-tube of Robert Prins, Dr. Linda Liau’s laboratory partner, who speaks about glioblastoma and immunotherapy in depth? Most of his talk is about NWBO’s lead product DC Vax-L, which we know Dr. Linda Liau at UCLA created. He compares DCVax-L to the leading checkpoint inhibitors, Keytruda and Optivia (sp?). He says that an agreement has already been negotiated between Merck, BMS, and a small immunotherapy vaccine company (NWBO, we presume) to begin trials with the vaccine and their products soon. Can you comment on this? Is this the partnership you allude to and where do you get your information? Thanks so much for this article. It is very in-depth. so, Larry, hope you read today’s news out of NWBO….what is your take on the entire 8 K filing….?? ?